Fixed point processors are generally smaller and consume less power than the familiar general purpose floating point processor does. In an application like acoustic echo control in mobile, the size and power of the DSP are crucial to providing long lasting service in a tiny enclosure. For the most common operations like addition and multiplication, fixed point offers a critical speed advantage, which is again ideal for any type of real time echo cancellation. Basically, using fixed point mathematics offers a unique opportunity to optimize the performance of your DSP. In other words, fixed point binary numbers are meant to represent a subset of the rational numbers. Take this in contrast with the natural binary numbers that everyone knows. As you have seen before, the natural binary numbers are binary representations of ℤ+ the non-negative integers. Just like with binary integers, fixed point numbers have unsigned, signed, and two’s complement representations. 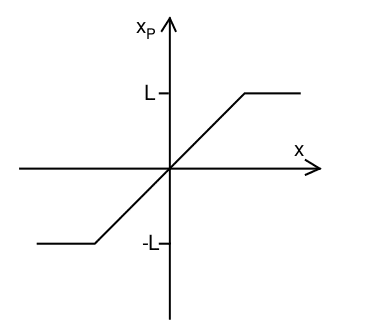 To get more into detail about what exactly fixed point numbers are, we will consider a general unsigned fixed point representation. We can use (2) to represent integer binary numbers in fixed point format. Signed format is represented as S(a, b) and requires the addition of a sign bit as usual. Now that we understand the fixed point representation, we are going to consider how we can convert ‘real’ numbers to fixed point ones as in . Real is in quotes because you will almost surely not be able to represent an arbitrary real number in a computer without some loss of precision. This is due to density of ℝ versus the finite storage space available in any computing machine. Forgetting about this technicality, we will start by considering that to represent any number in fixed point, we need to divide it into its integer and fractional parts. Where ⌊•⌋ represents the integer floor of αI. To floor a number means to round it down to the nearest integer. Where αImin and αImax are the most negative and most positive numbers αI may represent. Where ⌈•⌉ represents the ceiling operator, which takes a number and rounds up to the nearest integer. Notice that all together, we have an 18 bit number, which is not a standard register size. The next largest standard register size is 32 bits, so in fact, we could increase our resolution. Often, designers are faced with a predetermined register size and given a range of inputs they will need to represent. To ensure all of the incoming values can be represented, they will first determine the required number of integer bits. The remaining bits in the register will then be used for the fractional part, and the resolution that results is the resolution of the system. We will first consider the results of fixed point operations on the binary representations of fixed point numbers [1,3]. Division is usually a complex and expensive operation. To get around this difficulty, division is often formulated as a series of (inverse) products. Thus, division can be handled in the above manner. Compute α•β+к in fixed point when α = 1:50 , β = -1:25 , and к = π given a maximum register size of 8 bits. First, we must find the fixed point representations of each number. Notice that к is an irrational number, thus there is no way its full representation is going to fit in any realizable register, let alone an 8 bit one, regardless of format and so we know that we are going to lose precision. To illustrate the process, we will calculate αfx. In developing any filter, you either have a choice of an FIR or IIR scheme. Since FIR filters have no poles, FIR filters will always be stable, but this is not the case for IIR filters. This is because quantization causes poles to shift along a grid, and there exists the possibility of overflow. Here we will focus arithmetic issues in fixed point IIR filters. A fixed point IIR filter enters a limit cycle when its output oscillates between –R,R where R is the range of the format. Limit cycles can only happen in IIR filters because of their recursive nature. A limit cycle can be entered due to quantization or due to register overflow of an intermediate result. 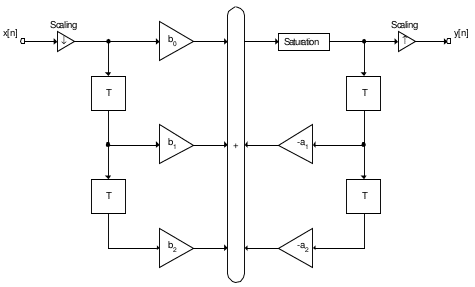 These two types of limit cycles are referred to in  as multiplier roundoff limit cycle and adder overflow limit cycle respectively. For an example, please refer to . Another way to prevent limit cycles is to appropriately choose your fixed point format such that guard bits exist. In the event that you are not sure what format to use but have access to sample data,  provides a simple method to determine the optimal word length. Given a fixed register size, the idea is to perform a type of Monte Carlo simulation across all possible formats given a test suite of random data vectors. An acceptable format is one that incurs no overflow during arithmetic or quantization and division by zero never occurs. The best format in the set of acceptable formats is the one with the smallest mean quantization error.